Got English, Scottish, Irish, Welsh, Australian or New Zealand ancestors? You'll be interested in the new beta website of an old favorite FindMyPast.com. They are rapidly adding US record sets as well, though primarily the federal census records at this time. Part of the beta includes an online tree option, which at this point must be entered manually. Coming soon will be the ability to import family trees from other websites or genealogy software. Also anticipate the ability to add documents and photos to ancestors on your trees. "Earlier today, we launched a new Beta version of findmypast.com that includes our International records from England, Ireland, Scotland, Australia and Wales. To the general public, we are launching an irresistible introductory offer for the World Subscription. Our introductory Pioneer Offer is just $4.95/mo. (normally $20.83/mo.) for a short time to a limited number of early subscribers. WHAT I DO LIKE ABOUT THE BETA SITE? From a beginning genealogy research point of view, the screens are simple and easy and quick to navigate. The hit list is viewable prior to viewing a transcript or image requiring membership. In this manner, folks can see if the site has anything that could possible mention an ancestor. The new $4.95 monthly if paid annually in advance for 100% access. PayAsYouGoCredits - the once workable old system where you could see a results page, but to view an image, you needed to spend "X" amount of credits. It would appear this option is no longer the best bet for regular researchers. I have yet to fully consider the search filters to refine a search. One the several tests I just ran on my existing personal account results seemed to load very quickly. 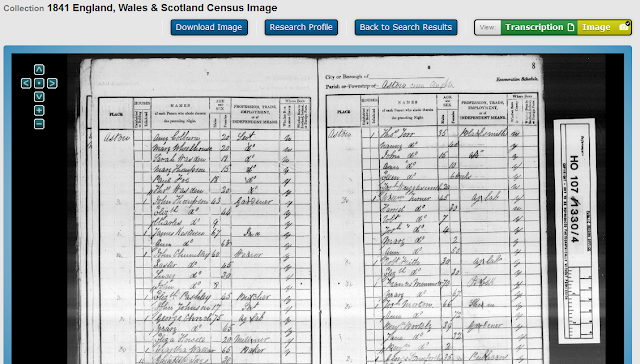 After typing in an ancestors first and last name, one then views a series of extracts with possible links to the full transcript and/or the image, as in this sample from the 1841 Census. Gender - F ERROR here! The image viewer used in Firefox 14.0.1 readily loads, and one may easily zoom in and out as well as move the image to view different parts of the page. For the life of me I cannot find a "catalog" of all record group titles and time periods covered. Have fun exploring this revised site, and tell Ol' Myrt how this compares with the old website. I'm still trying to figure out how much different the .com site is from the .co.uk one. I have a full subscription to the UK site, which doesn't give me access to the US site. I sure would hate to have to pay a double subscription if it turns out that there are non-overlapping data sets. My focus is on UK records, though, so perhaps sticking with that site will be sufficient. I guess I need to sit and compare, but as you say, there's no catalog of record groups. Hmmm. You can only use the website for your own personal non-commercial use e.g. to research your own family history. You can also help out other people with their family history by telling them about records available on the website and how and where they can be found. If you are using a subscription, you may not provide anyone with copies of any records (either an original image of the record or the information on the results page), even if you provide them for free." This appears to be VERY restrictive. Does that mean if I use the images for found records that I can't distribute my findings to my family? Also by saying "personal non-commercial" this would bar a professional from using it as well.